The emotional bond between humans and canines is historically proven. Police officers routinely put their lives on the line, and the strong bond between officers partnered together is documented. When human, dog and dangerous job are combined, the relationship takes on a strength well beyond the average. Many occupations involve a person working in partnership with another, such as doctor/ nurse and writer/editor. However, in these occupations a partner changes regularly due to promotions, moves and the like. When a K9 officer and a dog are paired, it is intended to be a partnership for life -- typically the dog’s lifespan, which is on average 10 to 12 years. The officer and his dog go through weeks of early training together, during which they not only learn to work together as a team, but before long they develop a partnership. Most co-workers spend an average of 9 hours a day together, then go their separate ways. The K9 officer and his dog are a 24-hour-a-day package. They live together, work together and play. The officer is responsible for feeding, grooming and general health. They trust each other completely and are there to protect and to serve the public, as well as each other, on a consistent basis. It's more than a handler and dog relationship; it's often an equal partnership, as well as two friends keeping each other company, on and off duty. The K9 officer goes through unimaginable stresses and relies heavily on his partner. Depending on the duty for which they were trained, together they will track or detain suspects who are often violent. They will search for potential bombs at schools and airports. They will be part of the dangers that fall upon border patrols. Together, they will search for missing people, or be part of a cadaver unit. Then they go home, and whether it’s a game of fetch to relax, or simply dinner and TV, their work day is over -- together. The K9 officer knows he may have a bad day, but his partner never will, and despite the dangers they encounter his dog will never be judgmental of the human race. K9 officers and their dogs have been shot together in the line of duty, and it's a good day when they both live to tell the tale. Police dogs have often died sparing the life of their partner and friend, and their friend isn't ashamed to shed a tear. 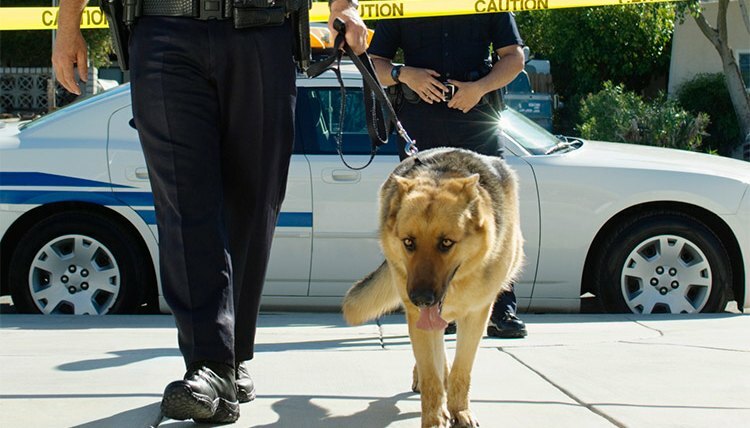 Together, the K9 officer and his dog perform daily duties that save many lives. Their heroics often go unsung -- and their special bond often goes unknown. Psychology Today: Is The Human-Canine Bond and Our Sense of Loyalty and Love for Dogs, a Modern Invention?